Bursting with flavors, slightly sweetened with apricot jam and simple to prepare, this one-pan bobotie casserole is a perfect dinner solution for your busy weekdays. Tired of the same old ground beef recipes? 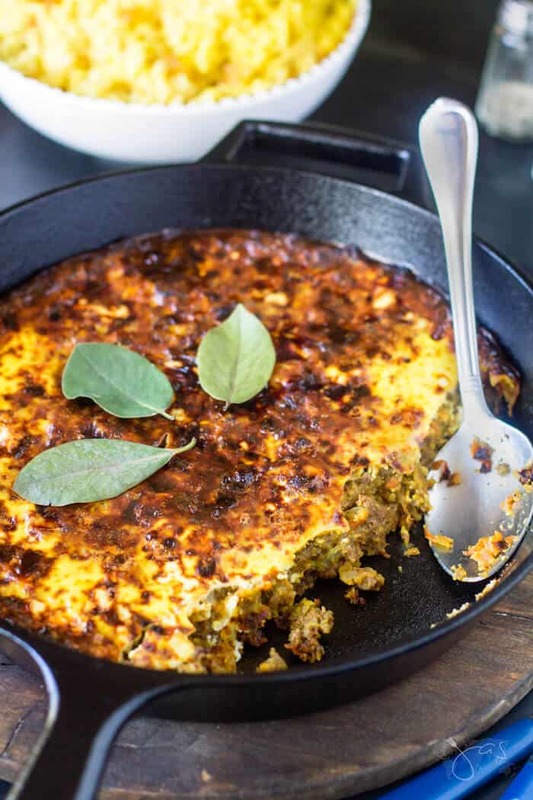 Then you will love this bobotie casserole, a traditional dish of South Africa, because you don’t need a new skill to make it. 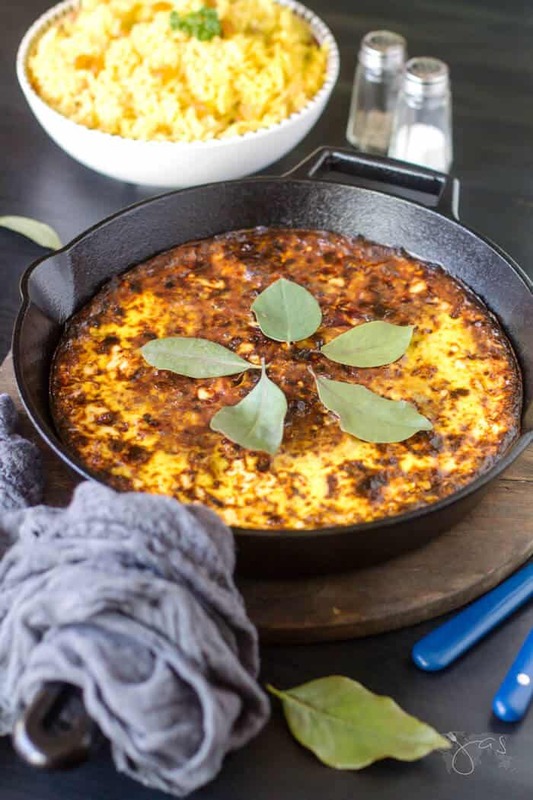 Bursting with flavors, slightly sweetened with apricot jam and simple to prepare, the bobotie will quickly become your family’s new favorite meal. Best of all, it’s made in one pan and thus a perfect solution for busy weekday dinners. Less time cleaning up = more time with your family. This South African casserole is similar to that of Greek Moussaka, minus the potatoes. It is traditionally served with yellow rice, which is also flavored with spices and sweetened with sultanas (golden raisins). But I suspect it could be served with potatoes or even alone. Leftovers are great for brunch! I love that we can make small changes and still enrich our food experience. Don’t get me wrong, I sometimes go to great lengths for a fabulous meal or a dessert, but on most days I just want something simple without having to rotate same dishes over and over. 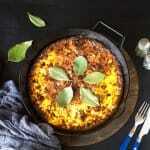 When my (South African-native) talented friend Michelle told me bobotie is her favorite dish and that I should make it, I hesitated. I assumed that it must be complicated or at least that it uses to me unknown ingredients. I was wrong (my husband is writing down this date, lol). It’s as simple as it was making their oatmeal cookie bars. Bobotie is like making a meatloaf without getting your hands dirty. Everything is cooked in one skillet and then the same skillet goes into the oven. Easy-peasy and delicious. It’s so good, I made it twice in a week! You can add 1/2 cup sliced almonds to the meat mixture. Transfer the mixture to a small casserole dish if you don’t have an oven-safe skillet. In a large cast iron or oven-safe skillet, cook the onion and garlic in the oil. Add the ground beef, salt, and pepper and cook until meat is browned and crumbly. Use a wooden spoon or a fork to break down large lumps. Add the carrot and lemon juice and mix through. Stir in the spices, jam, and sultanas if using. Add the breadcrumbs and broth and mix to combine. If the mixture is too crumbly add more broth, one tablespoon at a time. Level the mixture with the back of a spoon. Lightly whisk together the eggs and milk. Pour the milk and egg mixture (the custard) over the meat mixture and lay the bay leaves on top. Bake in a preheated oven at 350 degrees Fahrenheit for 30-40 minutes or until the egg custard is set and golden brown in color. Serve with rice. 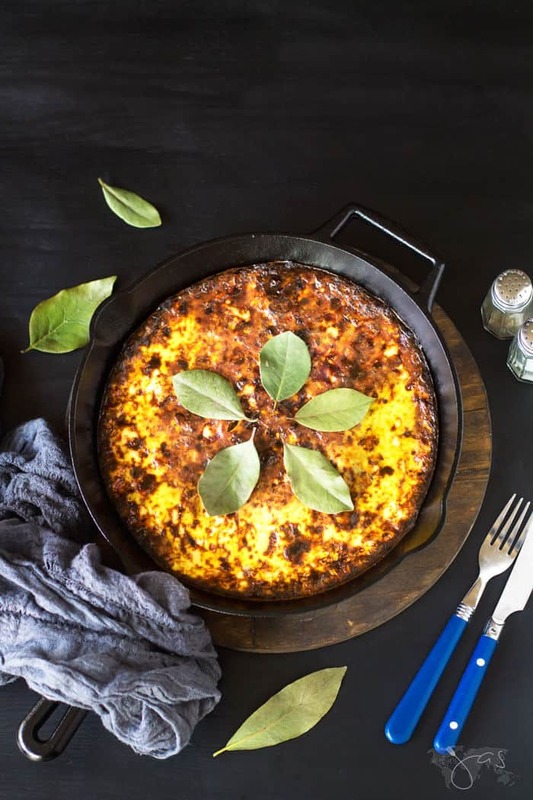 Bursting with flavors and simple to prepare, this one-pan bobotie casserole is a perfect dinner solution for your busy weekdays. • Replace fruit chutney with apricot jam, if you prefer. • You can add 1/2 cup sliced almonds to the meat mixture. • Transfer the mixture to a small casserole dish if you don't have an oven-safe skillet. Looks absolutely amazing, Jas! Such a complexity of flavors too, I’d love to try my hand at your bobotie. I would love to try this. It looks so good. I have pinned it. I joined a link up and noticed your post with the cast iron thumbnail. I was just wondering if you weatherize your pan and if so how? We love Bobotie! One of our dear friends from South Africa taught us how to make this several years ago and it has been a winter favorite ever since. The spices, the heat and the slight sweetness really add a special dimension of flavor. Just pinned! Sounds absolutely delicious Jas; if I didn’t already have pork chops in the slow cooker I would be making it tonight. However, I’ve pinned it & I’ve already pulled out the meat to make it tomorrow. My whole family absolutely loved the bars, so I’m sure this will also be a hit. Thanks for another inspiration! You know how to make my day, Mrs. Shoes! I’m ecstatic that you want to try it. Thank you! Hope your week is going great so far. Thanks, Carole! Hope you’ll give it another chance. This sounds really wonderful. I love the addition of a little sweetness from the jam and the raisins. Me too! Such a nice sweet note. Thank you! Oh my goodness! A South African friend of mine made this for me once, and I’ve wanted to make it ever since! This is such a gorgeous dish—not to mention delicious, and all made in one pan! That’s win-win-WIN in my book! Lucky you! All my South African friends live in, well…South Africa and just tell me to make it myself, lol. Thanks for stopping in! I’m always looking for new and interesting ways to use ground beef! This is something I’ve never seen before so SCORE!! Pinned it. Thanks for coming by the Friday Frenzy I appreciate you! Yay! I’m always thrilled about new recipes too, especially when they turn out super delicious. Looks great Jas and an extra bonus if you don’t have to get your hands dirty 🙂 Thank you for linking up with us at #BloggersPitStop and have a great week. Looks and sounds delicious. Thanks for sharing at the what’s for dinner link up! Now I need to check to see if I’m saying Bo-Bo-Tie correctly! Hey Jas! I’ll be honest….there is a lot in this recipe that I am usually not a lover of. BUT I am a firm believer that you have to try everything once!! I also like that it isn’t an “American” recipe! I think it’s good to try from different cuisines! I’m going to be “forced” to make this just to see what it tastes like…it sounds heavenly! I am so glad to find this in the blog hop today. It looks so yummy! I am saving this in Pinterest and will make it very soon. I MUST try this! Thanks for doing so well at teaching us how to do it. I’ve never heard of this before, but the combination looks delicious. We’d like it with chicken or beef; I love finding new recipes to put into rotation. Thanks for sharing Jas! You’re welcome, Lisa! Thanks for stopping by. This looks like a very flavorful dish that we will really enjoy! Thanks so much for sharing your awesome post with us at Full Plate Thursday. Hope you have a great St. Patrick’s Day and come back to see us real soon! This sounds very delicious and a change of pace. My mother-in-law used to make something she called hamburger pie. The seasonings were different, but the main ingredients much the same. I’m going to pin this and give it a try soon! I’ve been pretty good at guessing which recipes are yours in the lineup and this is another one I’d love to try. These days I’m big on one-pot meals and the Mr.is going to love this one also. Thank you for sharing with us this week at Celebrate Your Story, and I hope your week is going great. So good! I subbed almond milk for a dairy free option and it turned out great!